Our Products >> COLLECTIBLE AMMO, Current & Obsolete, All Countries. >> SINGLE Collectible Cartridges, Currect & Obsolete, All Countries >> RIFLE Calibers: Single Cartridges, All Countries >> Inch Cal., Rifle Singles, Current & Obsolete >> .120" to .299" Calibers, single cartridges >> .17 Hornet Center-Fire, Single Cartridges >> .17 Hornet Centerfire, Hornady, V-Max, 1 Cartridge , not a Box! Please Note: In above right photo for comparison, (on Left) .17 Hornet vs. (on Right) .22 Hornet. One Cartridge, not a box: .17 Hornet Center-fire (Standardized) by Hornady, using new Hornady Brass cases with “ •HORNADY• 17 HORNET ” Head-Stamp and loaded with a 20 grain Hornady “V-Max” (Plastic covered Jacketed Hollow Point) projectile. 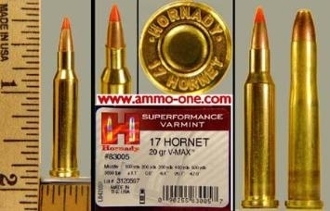 The new (standardized) 17 Hornet by Hornady was introduced in 2012 and does not have the same dimensional specifications as the original .17 Hornet Ackey wildcat cartridge. Basically the older 17 Ackley wildcat cartridge has a 38 degree shoulder vs. the 25 degree should angle of the new .17 Hornet (standardized) by Hornady. The older .17 Hornet Ackley wildcat, was originally a wildcat cartridge was designed by Mr. Ackley in the early 1950s; it was also called the .17 Pee Wee and O'Neil-Ackley, and the cartridge was created by necking-down the .22 Hornet to .17 caliber. The result was a small case with relatively little noise with the capable of high velocity. "Based on the 22 Hornet cartridge case, the 17 Hornet propels the 20 grain V-MAX at 3,650 fps. Fueled with Superformance Performance propellant, the 17 Hornet Performance Varmint delivers the trajectory of a traditional 55 gr 223 load, but is a pleasure to shoot with the felt recoil of a 22 WMR. The 17 Hornet is a fun .17 caliber centerfire cartridge that puts the STING on varmints out to 300 yards!" .17 Hornet Centerfire, Hornady, V-Max, 1 Cartridge , not a Box!